Once in a lifetime comes a story of true greatness such as the epic tale of Baboo and his best friend Ticky. That story is Kings of Mulberry Street, the new feature film written and directed by acclaimed director and producer Judy Naidoo. Feisty Ticky (Aaqil Hoosen) is the archetypal Indian artful dodger – cheeky and daring with a streetwise swagger and little respect for rules. He escapes the realities of his 80s Sugarhill District existence by living in a Bollywood dream world where he’s an unbeatable action hero. Rooftops are his kingdom. When chubby, timid Baboo (Shaan Nathoo) moves into the neighbourhood with his snooty, academic dad, Ticky thinks he’s the biggest loser he’s ever seen – but soon the two boys are drawn together by the shared threat of local bully and crime boss, Raja. These two nine-year-old misfits decide to rid their community of the evil Raja. Their plan –emulate the antics and mannerisms of Ticky’s Bollywood heroes. The battle between escapism and harsh reality is not even remotely matched, yet these heroes share a loyalty so special that they can conquer all. In the sugar cane fields of KZN, and the poor but vibrant and bustling streets (and rooftops) of Sugarhill District, the two unlikely comrades learn about life and overcoming obstacles, prejudices and their own deepest fears in this charming and hilarious adventure. 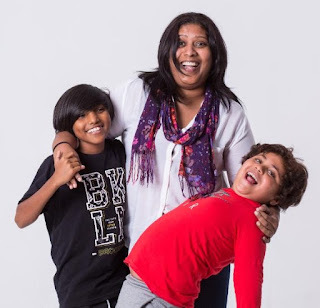 Delving deeper into the characters of the delightful boys, Naidoo explains that Ticky Chetty’s petty criminal, father expects his son will follow his lead. Ticky’s mother’s incessant panic and his bizarre granny all give the young boy good reason to do what he does best – ignore reality and escape into fantasy. In real life, Aaqil loves watching his favourite series Naruto, playing fetch with his dog and mastering chess with his little sister Naajiya. He is drawn to the ocean and is fascinated by sea creatures. He hopes to become a marine biologist one day. He also has a keen interest in archaeology, and likes to study things from the past. He hopes this will take him to different continents when he’s a little older. Shaan Nathoo, who plays this charming young fellow, is 9 years old. He loves drawing comics, animals, playing with Lego, cycling and having imaginary nerf gun wars with his friends. Catch Kings of Mulberry Street in cinemas on June 28, 2019.